bet365 are known as “the world’s favourite sports betting company” and it’s not difficult to see why, with thousands of markets available at the touch of a button, along with excellent promotions that only enhance your betting experience and now with their early Cheltenham promises, you can get even more! Get Non-Runner, No-Bet and Bets Odds Guaranteed on the big five races at the Cheltenham Festival! Join bet365 and get your Cheltenham Festival off to an early start! And thats not all, along with regular staples, such as the above early pricing, Non-Runner, No Bet refunds, and top prices on all UK and Irish racing among others, bet365 go the extra mile for punters, with great enhancements like Each-Way Extra, that lets you add or remove places in races and their Feature Race 4/1 offer that gives free bets on 4/1+ winners. 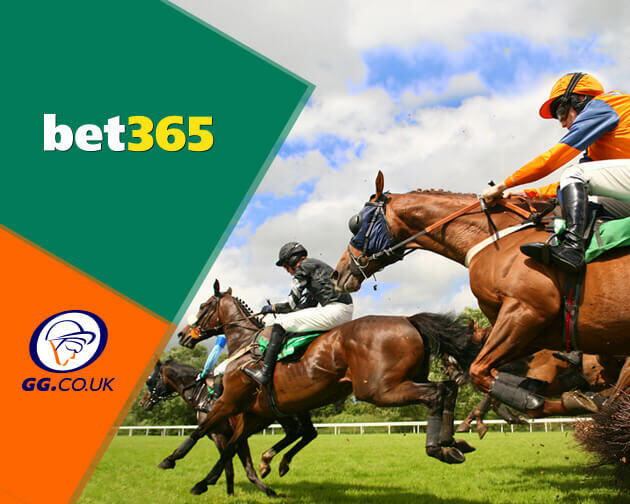 bet365 is also the best place for televised racing, with streaming of live and archived races via RacingUK and ATR available to customers, while ITV Racing coverage is also used to great effect, with bet365 guaranteeing the best price on all live ITV Racing and offering a free bet if you back a 4/1 winner or higher in any televised race on the channel. For the best in value, live streaming and great ongoing promotions, bet365 is your one stop shop for everything Horseracing and beyond. To release your Bet Credits you must place qualifying bets with a total stake value equal to or greater than the value of your qualifying deposit (capped at £100) and they must settle within 30 days of claiming the offer. 18+, UK and Ireland Only, T&C's apply. *Deposits made using NETeller, Skrill or Skrill 1-Tap will not count as your qualifying deposit. Bets placed must meet certain conditions to count towards the release of your Bet Credits. Must contain at least one selection at odds of 1/5 (1.20) or greater. In market/fixture combinations that only have two or three potential outcomes (for example Soccer Full Time Result), where you have placed bets on more than one potential outcome, either pre-match or In-Play, only the outcome with your highest cumulative stake will count. Where a stake has been partially Cashed Out, only the remaining active stake will count. Where a bet has been edited using our Edit Bet feature, only the new stake on the new bet will count. Fully Cashed Out, Instant Games, Gaming, void bets or bets placed via our Telephone Betting service will not count. Your Bet Credits are non-withdrawable, and Bet Credits stakes are not included in any returns. Any returns from Bet Credits placed will be added to your Withdrawable Balance. Bet Credits cannot be used on certain products, offers/promotions and bet types. See full Terms and Conditions for details. Your Bet Credits will be forfeit and removed if your account is inactive for 90 consecutive days.